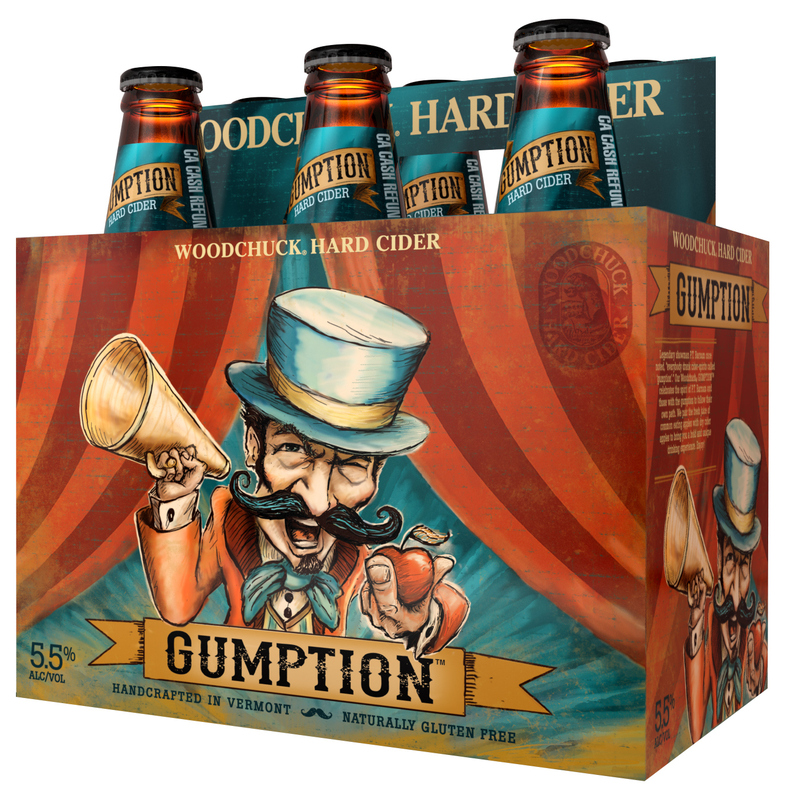 Review of Woodchuck Gumption, released March 2015, the newest addition to Woodchuck’s Core lineup. Their other core ciders are Amber, Granny Smith, 802, Pear, Raspberry, Local Nectar, & Hopsation. Pretty sweet packaging, huh? I tried Gumption previously and for some reason I wasn’t impressed, but I thought it was worth a second taste since it has been very well received. No idea why I didn’t like it last time, but this time, I did! Maybe because it was hyped so much I was expecting something epic? Woodchuck has even been having nationwide circus-themed release parties. Cider Description: Bold and unique. Legendary showman P.T. 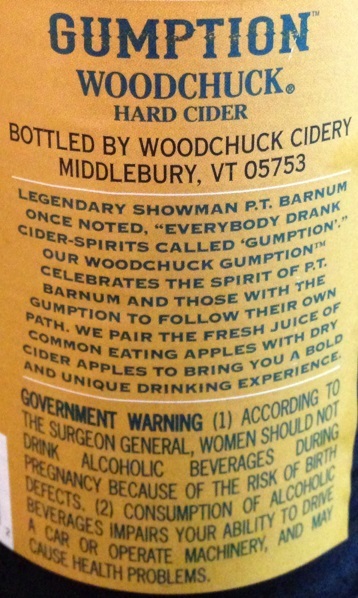 Barnum once noted, “everybody drank cider-spirits called ‘gumption’.” Our Woodchuck GUMPTION™ celebrates the spirit of P.T. Barnum and those with the gumption to follow their own path. We pair the fresh juice of common eating apples with dry (European Bittersweet) cider apples to bring you a bold and unique drinking experience. Cidery Description: Here at the Woodchuck Cidery in Vermont, we handcraft every batch of Woodchuck Hard Cider. Our Cider Makers utilize the highest quality ingredients and meticulously oversee each small batch from start to finish. We reinvigorated American cider in 1991 and continue to lead the category through our commitment to craft innovative and refreshing hard ciders. How Found: There was lots of online hype prior to release, so I had been on the lookout. I picked up my first single bottle at Total Wine just after it was released. This time I had been wanting to try it again, and found some at Special Brews. First Impression: Clear orange amber color (which appears to be true, unlike their Amber cider variety which adds color). Light carbonation. I only pick up one scent, of ripe sweet apples. Opinion: Sweet but not very sweet. I like the sweeter start with a touch of bitterness in the (quick) finish. I also like the lack of tartness and the balanced acidity. This is more complex than most of their other ciders, such as Amber, but isn’t all that complex when compared to most craft ciders. I even detect a slight woody earthiness. Gumption is very easy to drink. It doesn’t have all that bold of a flavor, but is unique and tasty. I find it interesting that the bottle says less than 1% natural flavor, but Woodchuck’s website says no added flavors….I wonder which is true. Most Similar to: Nothing I’ve tried. Most ciders which incorporate bittersweet cider apples are drier craft varieties. This is a unique cider for this segment. 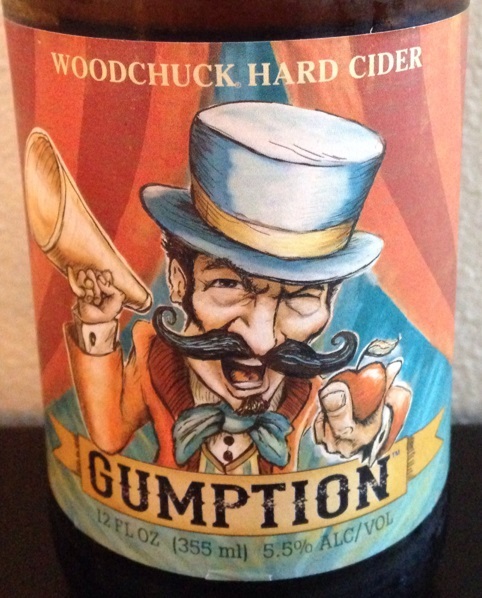 Closing Notes: I quite enjoyed Woodchuck Gumption, and may have to pick up some more. I now think I prefer it over their Amber variety (note this cider has significantly less sugar than Amber, 13 vs. 21 grams in 12 oz). I think this is a very solid commercial cider, but I wouldn’t consider Woodchuck to be a craft cidery. Woodchuck is undergoing a significant re-branding & marketing campaign to compete with Angry Orchard, so I’m intrigued to see what they come up with next! 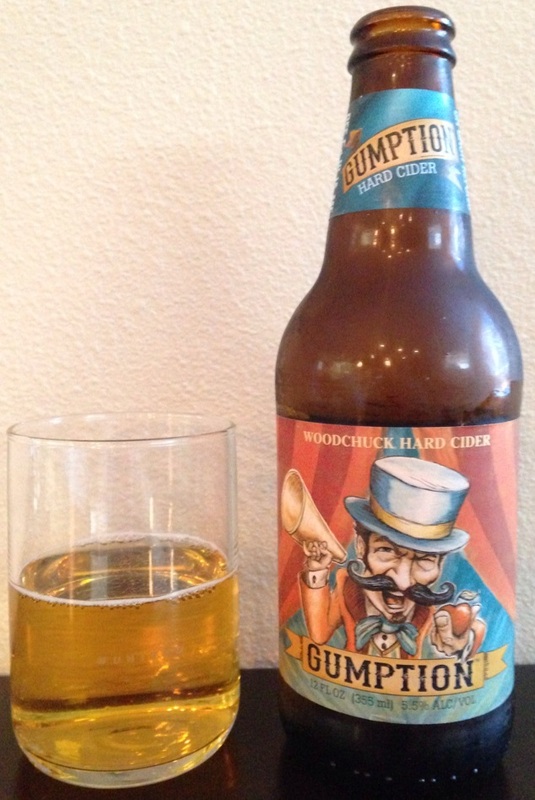 Have you tried Woodchuck Gumption? What did you think? I love this cider. It has a definite apple taste that I find very satisfying compared to many other ciders. 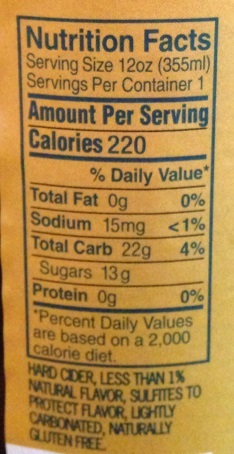 It’s not overly sweet nor too heavily carbonated. It’s crisp, like apples should be, without being overpowering. Recommend highly.